Indulge in this three bedroom and three bathroom, luxury beach condo in beautiful North Mission Beach. 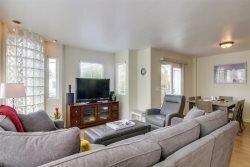 This lower unit home features a spacious 1550 sqft layout, a sophisticated, modern design and has spectacular views of the ocean from the living room and master bedroom. The kitchen features stainless steel appliances and granite counter tops. 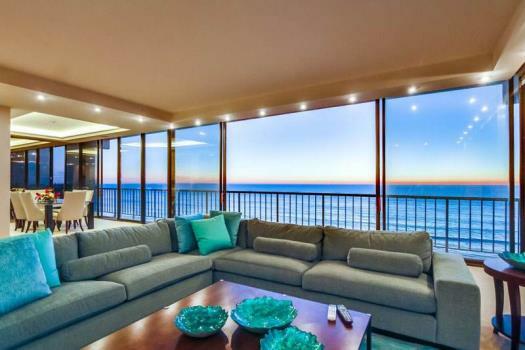 The living room features floor to ceiling sliding glass doors that exit on to a private, furnished patio that overlooks panoramic ocean views. The master bedroom includes one California King sized bed with a private balcony overlooking the ocean. The second and third bedrooms include one Queen Bed and one Double bunk Bed. This property features an indoor fireplace and an outdoor shower. All of your modern conveniences are provided; Cable TV, DVD player, Internet Access, Dishwasher, Microwave, Washer/ Dryer and private BBQ. Parking: 1 car garage as well as 1 outside space. The garage is also 8'-7" x 20'-9" and the space is 8'-6" x 28'-0". Maximum 6, non-smoking. It was truly quite amazing waking up to the unobstructed ocean view, opening the doors to the front of the apartment and hearing the sounds of the waves crashing onto the shore and bustle of people enjoying the beachfront walkway. There really isn't any better location in San Diego. The apartment itself was comfortable and spacious. The hosts at Penny were helpful and accommodating. Unlike a previous reviewer, we did not have any trouble with disturbed neighbors. I would only note that the garage is very tight and this should be considered when choosing a rental car. We had a compact and it was still difficult to open the doors when parked. A small note on an otherwise amazing stay. Easy and friendly. Jeff was great. Had an amazing time in Decked Out II. We will be back for sure. Good experience. Prompt answers to all questions. Everyone was very friendly and helpful from beginning to end. Couldn't ask for a nicer team. I enjoyed working with Jeff and Tina. I got quick answers to my questions even if I had to ask twice because too much time had passed between renting and arriving. My experience at the office was pleasant and efficient and I appreciated the arrangement for my daughter and her boyfriend to stay a few hours extra because their flights were much later in the day and the possibility that my son might arrive before I did and would be able to pick up the keys for me. I also appreciated having hard copies of the paperwork sent instead of relying upon email; I have no printer. There was a post-rental issue that Jeff helped me with also! I rate the property as above average because of its location and layout and how well it was stocked with kitchen and bathroom items as well as sufficient towels etc. Also, we enjoyed our stay right on the beach; we didn't even have to leave the house or the patio to enjoy the ocean. Great restaurants for great eating all day were w/in walking distance. (Yes, please quote this paragraph if you like.) But someday a reviewer is going to comment about some aspects of shabbiness which might affect future rentals. The umbrella doesn't work; the dining room table has lost some of its veneer; the dining room chairs are rickety; the doors to the patio do not close properly - there is a rod missing - and on a windy night, it was quite chilly even with the fireplace and quite noisy; the gate to the second parking space doesn't have a handle any more and the key doesn't work from the parking space side; the woodwork in the first floor bathroom needs to be touched up. Minor but noticeable and easily remedied. I am a landlord; I personally manage my 8 units. These are things I would want to fix and they wouldn't cost much. Also, when I hire cleaning people, when they are done it would be unacceptable to find accumulated dirt light switches, on baseboards and in corners or finger prints on door jambs and such as you find in the first floor bathroom - which is the one I used. I know too that salty air is the enemy of certain metals, but the condition of the bathroom sink faucet makes it look more dirty than corroded; it is an expense to replace these fixtures but it would present the property in a better light. I did not go into the other bathrooms to see if that is the case w/ them too. Also, the doors leading to the patio need to be cleaned on the outside from time-to-time to make sure that the view is optimum. Shouldn't that be on the check list for the cleaners too? And there was a piece of outdoor carpet bunched up on the patio that we had to get out of the way; no idea where it belonged. None of this spoiled the vacation but since I had such positive experiences with your office, I wanted to point out these things and encourage you to visit the property and take a critical look and encourage the property owner to fix what can be fixed and the cleaning crew to watch for the little things because it could avoid a bad review. Truly, I am not being snarky; I hope to be helpful. Incidentally, a poinsettia for the table or a string of lights on the patio would have been a nice welcoming touch and acknowledgment of the holidays ... just a thought and a comment made by one of the crew after we saw all the lights elsewhere along the beach and on the bay - some in rentals too. I'd go probably 4.5 out of 5 stars, but I'll got the extra half, rather than just call this place Good. Location: Great location. Right on the boardwalk/strand. Yet set back JUST enough so that people aren't like within arms reach of you as they walk down the boardwalk. Liquor store about 5 minutes away with most supplies you'd need, they cater well to short term renters emergency needs for almost everything. Beach is very clean, cleaned every morning by the city. Surf is actually surfable some parts of some days. Property: New appliances, washer/dryer seem brand new, kitchen everything good, including electric stove top is nice, oven is nice (reset breaker if the controls are frozen), we used 'em all. Comes with good enough coffee maker. Utensils, plates, coffee cups, filters, pepper/salt, we didn't really have to buy much if anything. Grill used quite a bit, but clean and works fine, uses propane line from house, so you can grill as long as you want. Front beach glass doors are super cool and open up to make practically the whole wall open to the apartment main living room. AWESOME. Master bedroom open to the beach, you sleep to crashing waves sound. Bathrooms very clean. Tile floor very durable nice, easy to sweep of sand and keep clean. TV's work, DishTV or some similar service, works in main room, master bedroom and rear bedroom, have not tried the others. Fireplace works fine. The sound bar is rusted out and too bad it would not work. BRING YOUR OWN WIRELESS SPEAKER thing for your chill moments. We forgot to bring ours and regretted it. Everyone has some tunes around here they carry around. You won't need the A/C so I don't even know if it works, we didn't touch the stats. Now for a couple downsides. Pacific Beach and Mission Beach are a bit on the ratchet side. This is not a gated community in Malibu here. We had one drunk European walk off the beach into our living room and try to buy a bathroom pass. We dispatched with him quickly. Then a homeless guy on the boardwalk this morning was having a psychotic episode and was screaming at me and my daughter with evil intent. We finally had to retreat inside and he went on to rant and rave at other people on their lanai, threatening to come inside their place. We called the cops, who finally showed up 15 minutes later. Sort of par for the course here. 99.9% of the people are kind locals and tourists and as nice as can be. Just understand, this is more like Venice Beach here!